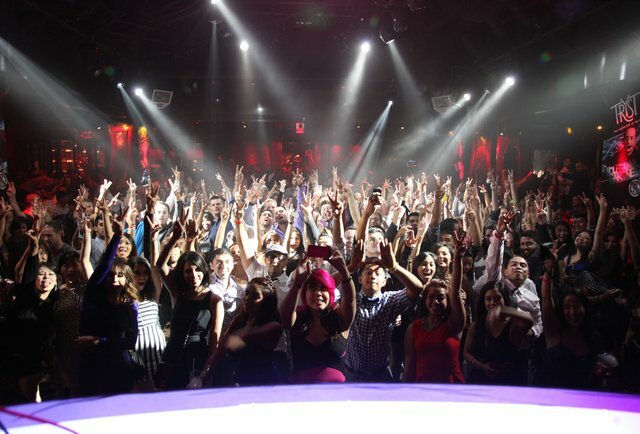 We've already told you 12 things you didn't know about MGM mega-club Hakkasan, but with PURE shutting down for renovations and LAVO turning into a full-time lounge, we figured it's time to tell you everything you need to know about the rest of Las Vegas's best nightclubs: check out our list for all the best places to blow your money on bottle service, foolish tips, and drinks for girls who... and we hate to be the ones to tell you this... already let the guys at the next table buy 'em some, too. 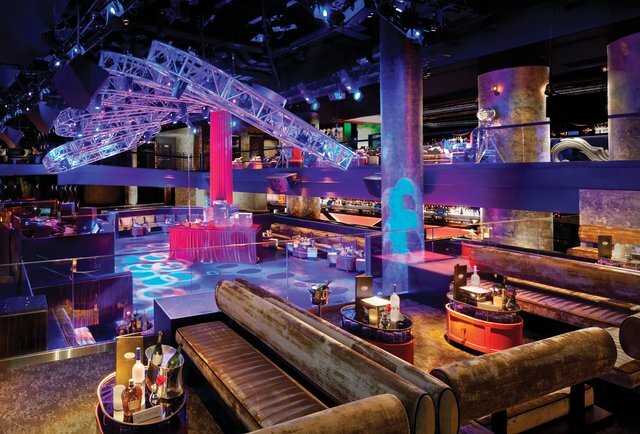 What you can expect: XS is one of the most expensive nightclubs ever built: there's plenty of gold everywhere you look, a crowded dance floor, and an outdoor pool area that offers some breathing room and bottle service under the stars. Who will you see? 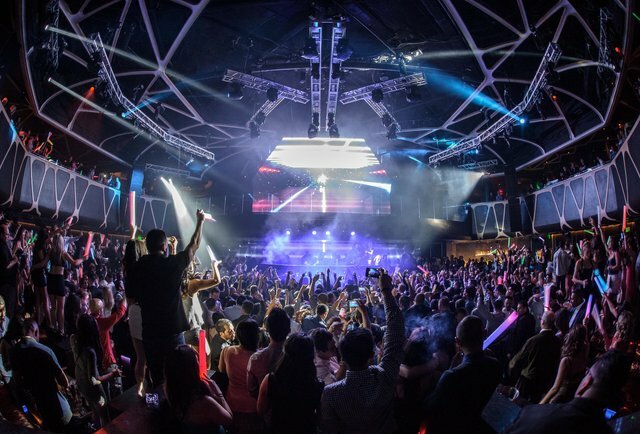 Some of the top DJs in the world, including Avicii, Zedd, Skrillex, and Deadmau5 – who was brought back after his stint at Hakkasan last year that seemed to end right after it began. Bonus perk: The casino’s other nightclub, Surrender, is right around the corner if you need a change of venue on the fly. When to go: Sunday Night Swim. It’s your chance to get wet… when you fall in the pool by accident. What’s missing? Some extra space -- the dance floor always feels crowded. What you can expect: Stairs. Lots and lots of stairs connect the venue’s five floors, which include a huge dance floor, spacious bar areas, and, if you need some downtime, the Ling Ling Lounge, which is perfect for grabbing a seat and escaping the dance party for a little while. Who will you see? The biggest DJs in the world who aren’t signed to XS. That includes Tiesto, Calvin Harris, Afrojack, and if you come on the right night, Questlove spinning in the aforementioned Ling Ling Lounge. Bonus perk: The adjacent Hakkasan restaurant offers the best Cantonese food you’ll find in the state of Nevada. After dinner, you may be able to make your way into the nightclub without dealing with the long lines outside. When to go: Thursday. It’s the only non-weekend day it’s open. What’s missing? An outdoor area. Even this massive space can get a little claustrophobic after a while. What you can expect: A nightclub that almost feels like a movie theater with a main rectangular room that slopes downwards and surrounds the dance floor. Who will you see? The Kardashians seem to like this place. Kim hosted the New Year’s Eve bash here with her baby daddy Kanye West. When to go: Flashback Fridays for old-school acts like Naughty by Nature (hey!...ho!). What’s missing? A few more rooms to explore. What you can expect: Lots of space, a lot of different rooms (including a “Library” in case you want to read up on some Grisham), and an outdoor area by the pool. This place has it covered. When to go: Marquee battles it out with XS to draw the locals on Monday nights. Go even if you’re from out of town. It will be one of the busiest spots you can find that night -- with some of the hottest girls. What’s missing? A better way to get in: even when you’ve got a hookup, it still takes a while to get through the door, up the escalator, and into the venue. What you can expect: Light doesn't just want to be a nightclub, it wants to give you a show. That’s why it partnered up with Cirque du Soleil… and why you’ll see acrobats dangling from the ceiling. And a monster LED screen behind the DJ. Who will you see? Among the regular crew of DJs is Baauer – the guy responsible for the Harlem Shake. Check him out so you can party like it’s 2013 all over again. When to go: Light is only about a year old – and still draws long lines on the weekend. Going on Wednesday, the one weekday it’s open, is your best bet. What’s missing? Despite its name, Light is actually kinda dark and a little gloomy if you’re not on the dance floor – which the entire place is built around -- so it feels more like an EDM concert than an actual club. What you can expect: When you’re done with the dance floor, bar areas, and fancy chandeliers, head on over to that elevator at the end of the club. It will take you to an outdoor patio with plenty of fresh air and a nice, midlevel view of the Strip. Who will you see? For some reason, this place seems to attract bachelorette parties more than any other nightclub. Whether that’s good or bad is up to you. Bonus perk: The Sugar Factory is just steps away and open 24/7. It’s perfect for breakfast or a Blow Pop Martini. The choice is yours. What’s missing? While the outdoor patio is great, the inside is a little plain by comparison. What you can expect: Lots of different rooms playing lots of different music, plus sushi, dumplings, and other Asian eats in the restaurant downstairs. Who will you see? Snoop Dogg – who recently launched the Snoopadelic Cabaret; his own hip-hop version of a 1920s-style speakeasy. Bonus perk: Girls dancing on tables, girls dancing inside glass boxes, girls in bathtubs covered by flower petals. You get the idea. When to go: “Worship Thursdays”… where locals get in for free at the popular industry night party. What’s missing? A bigger balcony. Unless the pool area is open, the only spot with an outdoor view is a small, thin patio next to the main dance floor. It gets packed quickly. Where is it? The Bellagio, natch. 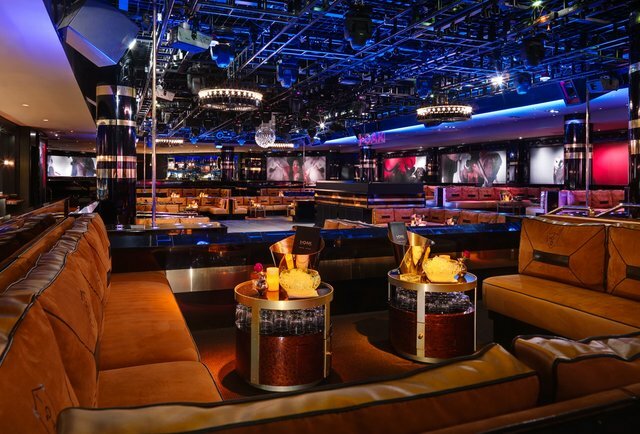 What you can expect: A lounge with a nightclub atmosphere, all sorts of bottle service packages… and a perfect view of the Bellagio fountains from inside the resort. Who will you see? Paris Hilton likes to DJ now… and gets paid bank for it. Bonus perk: You might get splashed by the fountain a little bit, which may or may not actually be a bonus. What’s missing? The place packs in so many VIP tables that there's hardly room for the dance floor, the bars areas, and places where you can just stand around while holding your drink up to your chest and hoping a girl starts a conversation with you. What you can expect: Lots of dancing and a DJ indoors, plus tons of room to hang out outdoors by the pool. Who will you see? Headliners include Macklemore and Ryan Lewis, last year's hottest rapper/whatever the heck Ryan Lewis is. Bonus perk: There’s gambling by the pool, so you can win some of that money you just spent on Champagne back. When to go: Wednesday is locals night and draws a pretty hard-partying crowd. What’s missing? More indoor space. But stop whining and just enjoy all the fun out by the pool. What you can expect: A nightclub with a more subtle, intimate atmosphere as well as an outdoor deck and pool area. Bonus perk: A waterfall out by the pool. When to go: Thursdays. It’s your chance for some breathing room. Most of the party kids will be packing up Tao for locals night down the street. What’s missing? Space. It may resemble XS and Surrender with the indoor dance floor and outdoor pool thing, but it’s a lot smaller. What you can expect: Celebrity impersonators scattered throughout the crowd and a low-brow variety show on stage that includes midget wrestling and heavy-metal balancing acts. Who will you see? 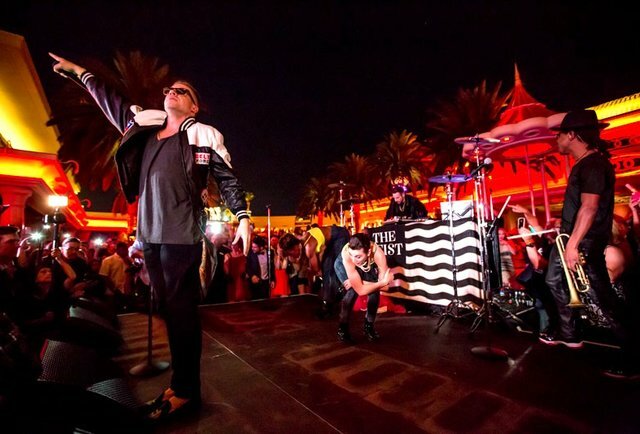 Miley Cyrus helped open the place… and tends to come back now and then to get her party on. Bonus perk: Little people hanging from the ceiling who fly across the room to deliver bottle service. When to go: It’s a good weekend alternative to the long lines just down the hallway at Hakkasan. What’s missing? Some of the VIP areas have long living room couches which are comfy for watching the stage… but not so good if you want to actually talk with the people in your group. What you can expect: A dark dance floor, go-go dancers, and acrobatic performers. Who will you see? Floyd Mayweather Jr may show up. But you’re more likely to see a bunch of guys standing around, taking up valuable real estate on the dance floor. Bonus perk: If you need a change of scenery, you’re an escalator ride away from a bunch of bars and restaurants. What’s missing? An easier way to get from one side of the nightclub to the other without having to plow through everyone on the dance floor.